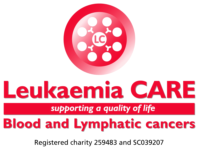 Leukaemia CARE is a charity which exists to provide vital care and support to all those whose lives have been affected by leukaemia, lymphoma, myeloma and the allied blood disorders. Their work extends to the welfare of families and carers, as well as that of patients themselves; simply supporting a quality of life for all. Their support services include a 24 hour CARE Line through which anyone living with a diagnosis of a blood or lymphatic cancer can access support and advice. They also provide patient advocacy services, regional support groups, and supply information and booklets. Follow Leukaemia CARE on Facebook. Follow Leukaemia CARE on Twitter.